Rosaceae - rose family Dicot. 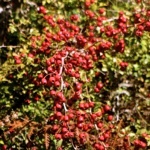 The hawthorne, Cratageus monogyna, is common throughout Europe; it is often planted to form stock proof hedges. In Skopelos it is generally found as a bush but it sometimes forms a large tree and there is a famous specimen in Crete, the Hawthorne of Zominthos (Η τρικοκκιά της Ζωμίνθου) which is 12 metres tall. In spring hawthorne is covered in creamy white blossom, known in England as May blossom. The flowers havewith a distinctive smell, loved by some but not all, and in many countries it is considered to be bad luck to take them into the home. In ancient Greece however the flowers were considered a sign of purity; they were used to dress the bride and a bouquet of hawthorne was carried by the groom.